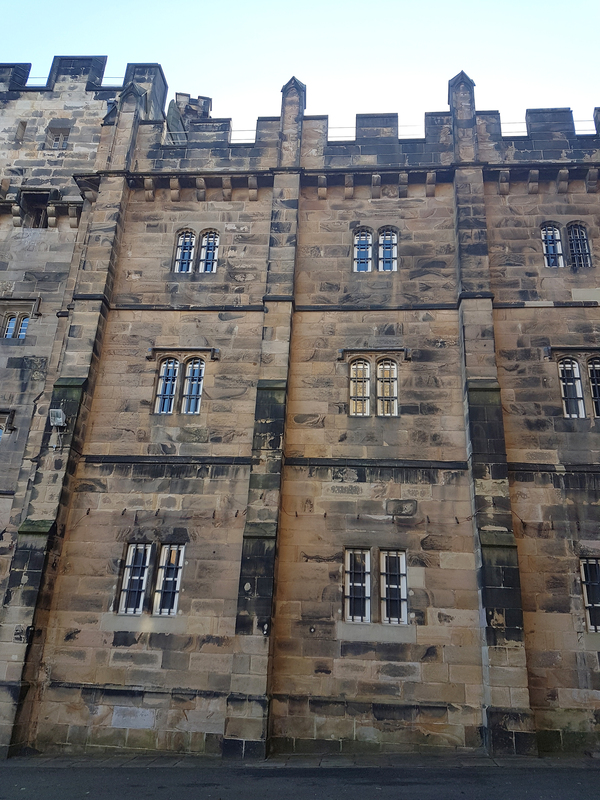 We visited Lancaster on the 29th October for the Jailbreak 10k and luckily managed to fit in a tour of the Castle itself. Of the four of us who travelled down, myself, my sister and parents, none of us had ever visited Lancaster before. Surprising considering it is actually quite close to us, is a beautiful city (from what we saw) and has a castle – something my dad LOVES to visit. We set off at around 11am that Sunday morning. A frosty feel to the weather, but bright blue skies welcomed us as we pulled into the city. Finding the castle was quite easy. Set at the top of a hill, you can’t really miss it. 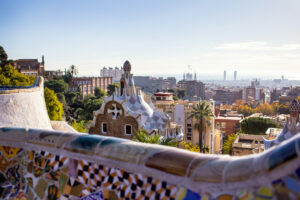 Perfect in design though – it means that from the castle you can see for miles. Just what they needed when defending themselves in the war times. The main courtyard in the castle is impressive in itself. You can stand in the middle and just do a full 360 looking at all the different walls and buildings that make up the castle. As our tour guide went on to tell us, the castle started as one building and in time they needed more space, had more wealth and of course expanded on the castle. It means that each building is a different age and looks slightly different. I love that. Actually I discovered a small love for history after visiting here – never felt so captivated! After I quickly grabbed my race number, we followed the signs to the reception and found ourselves inside what looked like a prison. And that’s because it was – only shutting in 2011! 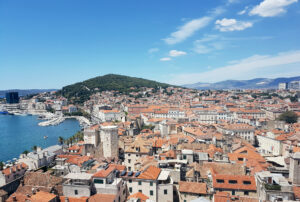 It was first used as a prison in 1196… Just imagine that! It was the longest running prison in England I believe up until it closed. I’m not sure whether that still stands as a record. 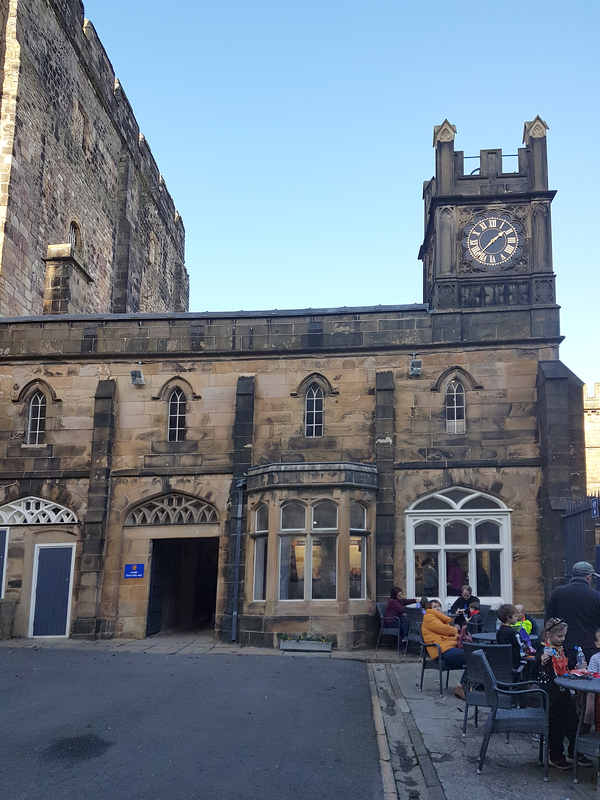 The hour long Lancaster Castle Tour costs £8 for adults, £6.50 for concessions and £20 for a family. I think it’s worth it. 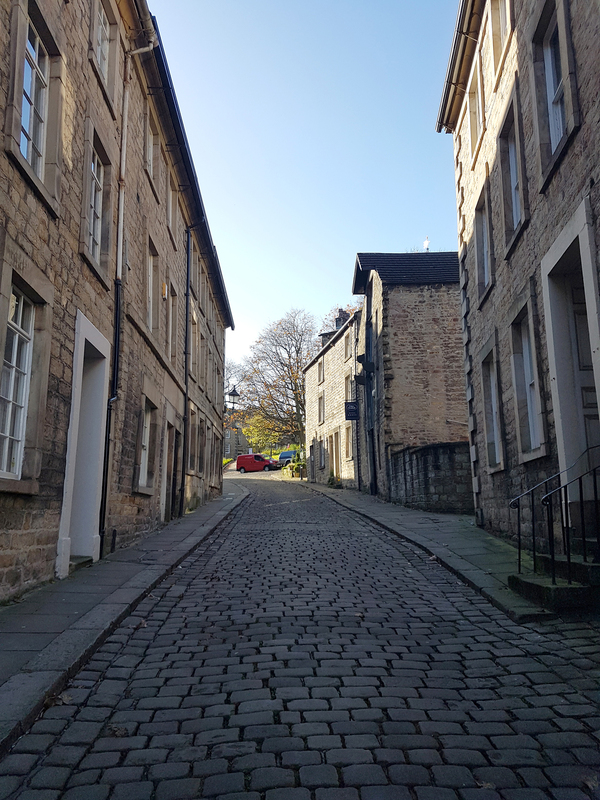 Although you only see certain parts of the castle, and cannot go in every area, you gain plenty of historical knowledge (about Lancaster itself too!) and see some really cool stuff along the way. 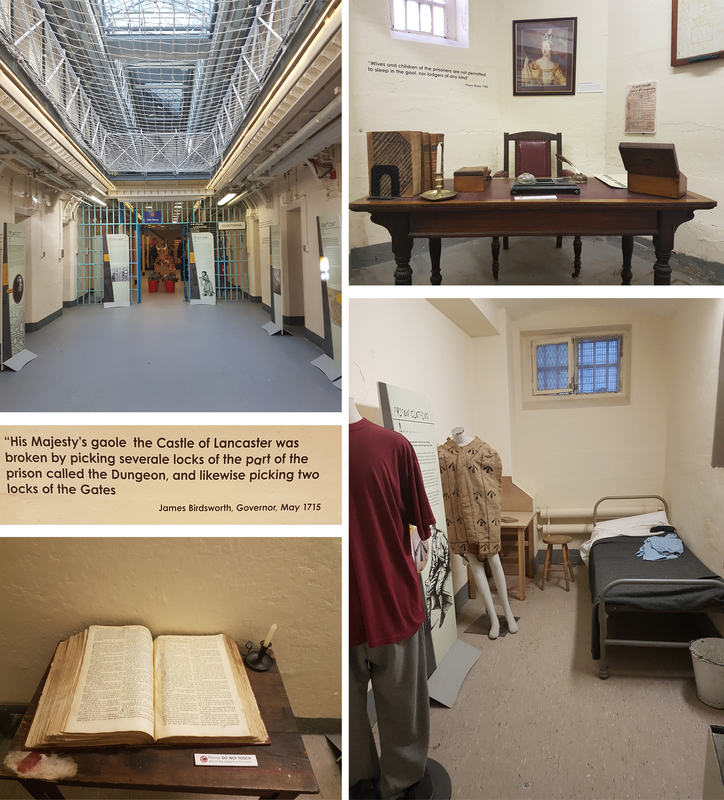 These rooms contained random belongings, notes and information about what it was like to be prisoner here. The information inside each room was super interesting, and I really enjoyed reading all the quotes printed on the walls too. 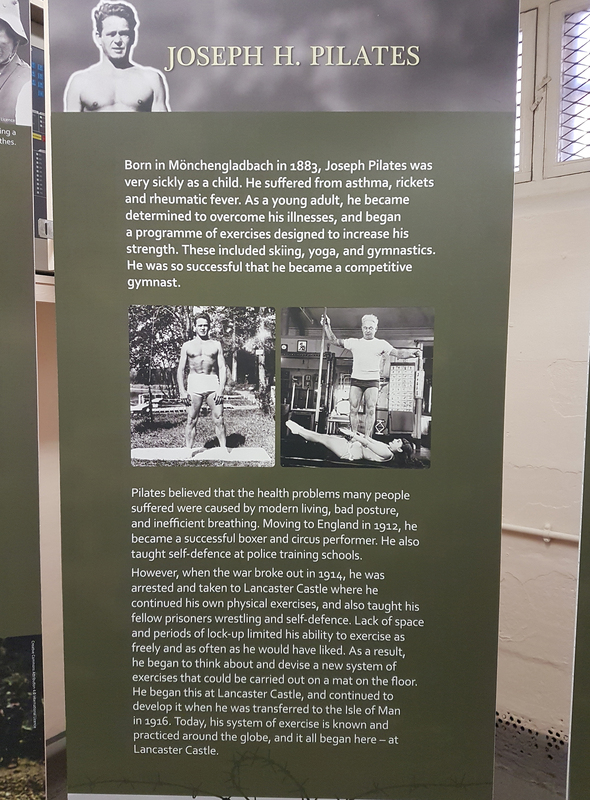 I photographed this sign about Joseph H. Pilates because I was actually just so amazed… It was my dad who read it first and called me over – because of course, if it’s fitness related I WILL be interested. So apparently the exercise Pilates comes from Joseph’s own personal exercise regime. One he created due to lack of space, and also due to often being stuck in his room when he wanted to exercise it seems. (Because of course – prisoner.) It also says he taught his fellow inmates wrestling and and self-defence skills. I don’t know what he did to get arrested, but from the life he lived before, he sure sounds like an interesting guy. 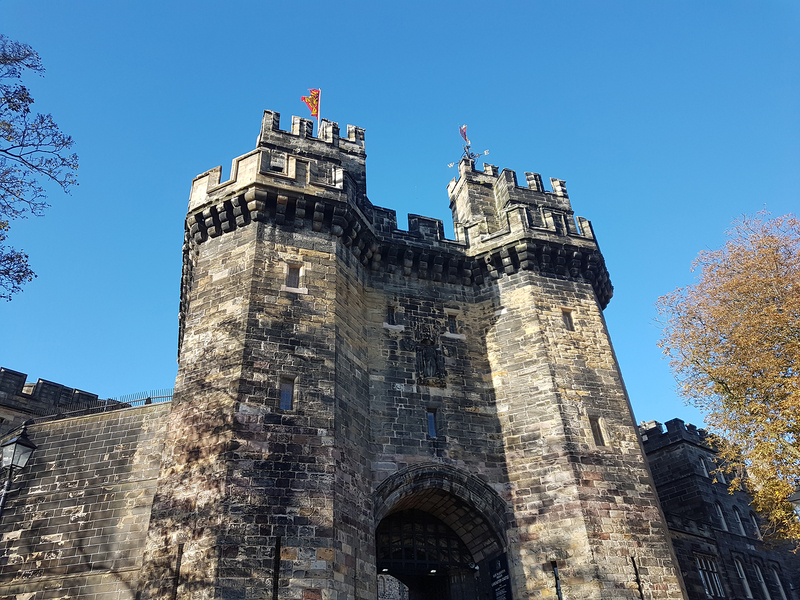 Who knew that pilates originated in Lancaster Castle eh?! I certainly didn’t! This area of the castle also had a gift shop with the usual kind of souvenir items you’ll find – pens, toys, old coins, keyrings, books etc – and a small dress up corner for the kids. Or for my myself and sister. 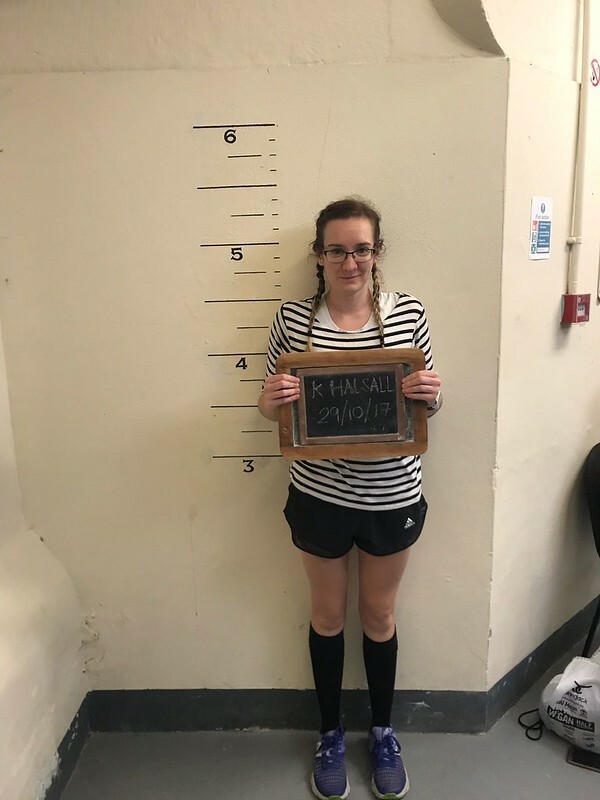 I particularly liked the height chart on the wall and the chalkboard so you could create your own prison mugshot. You can see that monstrosity here. As for the tour itself, we had Cameron guiding us and he was brilliant. He was enthusiastic throughout the hour long talk, never wavering or seeming disinterested, and you could definitely see his passion coming through. I know he does this day in, day out, but I don’t know how guides remember so much information. Amazing. Cameron was really knowledgeable (and put the rest of us to shame when we couldn’t answer simple questions…) and kept the talk entertaining too. And hey, I actually retained information that came in handy when a question about the estates of the Duchy of Lancaster, and who the money goes to appeared on our pub quiz yesterday! The Queen, if you were wondering. Did you know that she’s the Duke of Lancaster? We didn’t on the day. Trick question when he asked, because who would say the Queen when asked for a duke eh? Apparently it is always the reigning monarch. 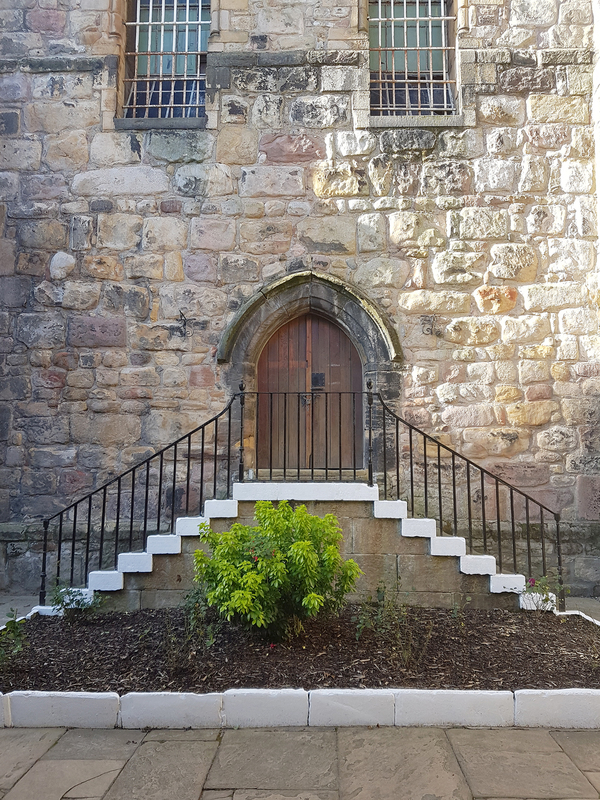 The crown court is still actually located within the castle, and this meant that there were (really interesting!) parts of the castle that we weren’t allowed to photograph. Disappointing, but understandable because as a working court room it is illegal to take photographs. This one room was beautiful though, with all the shields of constables, high sheriffs and monarchs on the wall. You can see some of them here. Right at the end we got to see come of the really old cells that people would be kept in whilst waiting for a court hearing. Pitch black, lots of people shoved inside, straw on the floor, and no toilets… And they could be in here for days, weeks, months. We had the chance to experience the darkness if wanted. Of course we all said yes. It was strange! Cannot imagine being inside for more than the couple of minutes we were. I’m glad I discovered that there was a 10k race here, and I’m glad that I managed to persuade my mum that it would be a nice day out. I think the castle exceeded all our expectations (we’ve been dragged around many a ruin, not going to lie) and the tour was well worth doing. The nice (although bitterly cold) weather was the icing on the top of the cake. 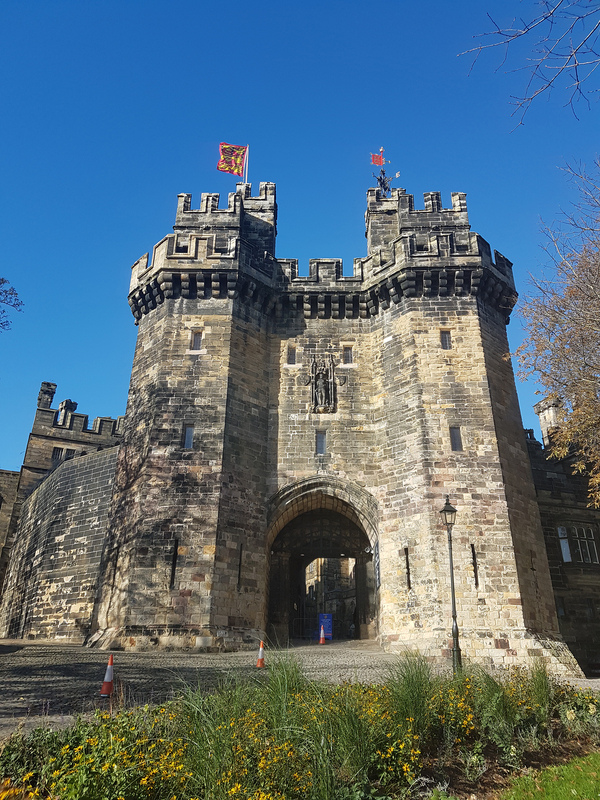 Lancaster Castle doesn’t take long to explore, but it would be great to see as part of a visit to the city. Great for all kinds of people. 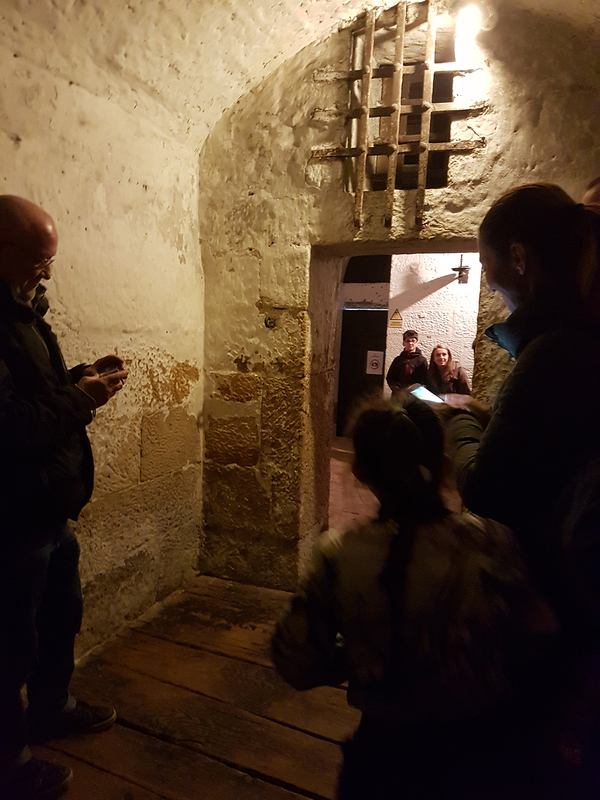 Our tour group had solo visitors, families and older groups of people so we were of all ages and different backgrounds. I would definitely go back! Have you been to a castle lately?